No two properties are identical. Each has unique features that when fully understood provide opportunities for effective long-term stewardship and management. Inventorying a property's natural resources identifies the benefits and limitations for a variety of land uses. From forest products to development siting, economies are maximized by doing what is best for the land. For private land owners, there are multiple tax benefits as well. And land use that conserves natural functions and resources provides for future generations. EECOS has the expertise to make land a performing asset. Since the relationships and interactions affecting land-use decisions are complex, EECOS uses a holistic approach. Working with detailed scientific field data and assembled information, we study the direct and indirect impacts on water, geology, soils, wetlands, plants, and wildlife. STARLING CHILDS, II graduated from Yale College with a degree in geology and from the Yale School of Forestry and Environmental Studies, where he received a Master of Forest Science degree. 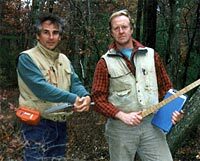 Prior to his co-founding of EECOS, Mr. Childs set up his own forestry consulting business to meet the needs of private, non-industrial forest landowners. His expertise in the areas of land use, forest hydrology, and land management has earned him a great deal of recognition within Connecticut. Currently he serves as a director of Connecticut Forest and Parks Association, Berkshire-Litchfield Environmental Council, and Connwood Foresters, Inc. Through his work he has sought to strike a balance between sustainable management of natural resources and preserving the natural environment. ANTHONY IRVING did his undergraduate work at Hobart College and received a Master of Environmental Studies degree from the Yale School of Forestry and Environmental Studies. There he specialized in conservation biology and ecology. Prior to his graduate work, he spent more than ten years in the publishing business in New York City. This in-depth business background, combined with an intimate knowledge of environmental issues, gives him a unique insight into the relationship of environmental costs and benefits to economic considerations. As a specialist in forest ecology, his field of concentration is the relationship between land-use practices and environmental impacts. Mr. Irving is vice chairman of the Town of Lyme's Conservation and Inland Wetlands Commission and is president of the Lyme Land Conservation Trust.